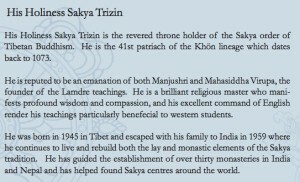 The 41st throne holder of the Sakya tradition of Tibetan Buddhism, His Holiness Sakya Trizin, will kindly bestow the Empowerment of Vajrakilaya. In Tibetan, Dorje Phurba, rdo rje phur pa, Vajrakilaya is a major empowerment which extends over two days. The first day is the preparation and the second day is the main empowerment. The first day is Friday, April 24th. Attendees arrive no later than 3:00 pm. The second day is Saturday, April 25th. Attendees arrive no later than 1:00 pm. Without exception, you must attend both days. The location will be in the area of Ewam Choden. Pre-registration is advised since the number of attendees will be limited according to the size of the venue. The cost to register is $150.00 for each person. There is no prerequisite. ALL INFORMATION WILL BE IN A PACKET TO BE SENT TO ATTENDEES WITH THEIR TICKETS. 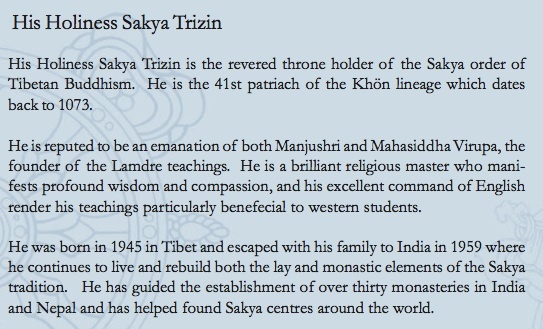 This is a profound practice with a long and powerful Sakya lineage. “Of the profound and inexhaustible ocean of teachings that Guru Padmasambhava possessed, Vajrakilaya is one of the most important. Its empowerment, teachings and pith instructions were given to one of his most important spiritual disciples, Khön Nagendra Rakshita (Lü’i Wangpo Sungwa), who then practised it until he achieved both ordinary and supreme siddhis. As a sign of his great attainment, he managed to display the great miracle of keeping his vajra and bell suspended in space. 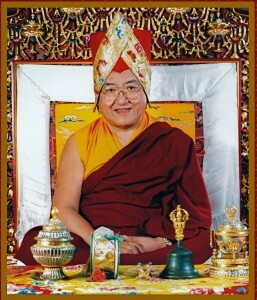 Guru Padmasambhava himself declared that Nagendrarakshita had attained the eighth stage of the great bodhisattva path. The Vajrakilaya empowerment, teachings and pith instructions then passed down from Nagendrarakshita to his own nephews, as they were appointed as the holders of the Khön lineage; and ever since then they have been passed down through this lineage, which includes the five Sakya patriarchs. Ven. 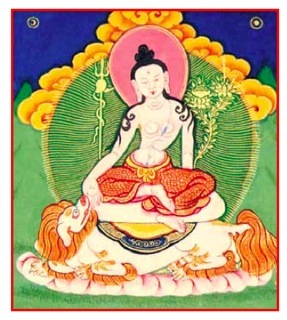 Lama Kunga Rinpoche has kindly agreed to bestow the Empowerment of SINGHANATA, LION’S ROAR AVALOKITESHVARA (Senggedra Chenrezi). He is seated with the Naga King and many great nagas. His practice cures secret naga diseases and purifies non-virtuous karma, as it takes you on the path to enlightenment.